Group Policy Objects (GPOs) are the holy grail when it comes to Windows® system management. They are one of the primary reasons IT organizations continue to leverage Microsoft® Active Directory® (AD), despite numerous limitations. One of those limitations is that GPOs can only be applied to Windows systems. That is why IT organizations are interested in a Mac group policy equivalent. GPOs for Mac (and Linux for that matter) would be a dream come true for IT admins. The good news is that a next generation managed directory service has emerged that can provide GPO-like capabilities for cross platform fleets of systems (e.g., Windows, Mac, Linux). In short, the next generation solution is called JumpCloud Directory-as-a-Service®. 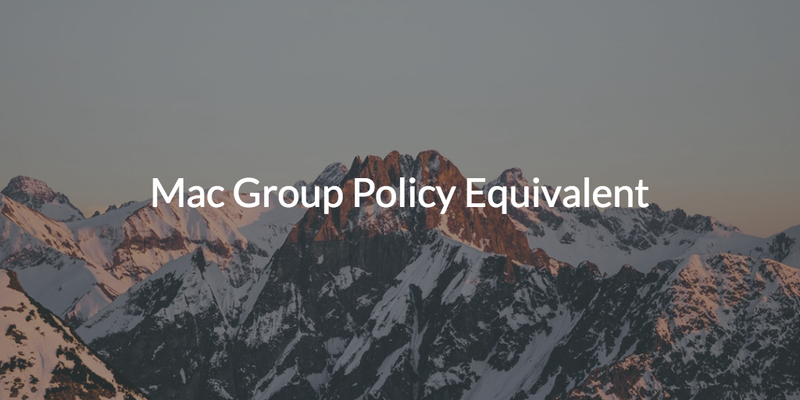 However, in order to understand the significance of a Mac group policy equivalent, we should highlight the importance of GPOs from a holistic perspective. Microsoft pioneered the concept of Group Policy Objects when they introduced Active Directory in 1999. GPOs are effectively prescribed commands and scripts that can be used to set screen lock timeout, disable USB ports, manage guest access, and configure a variety of other system behaviors. 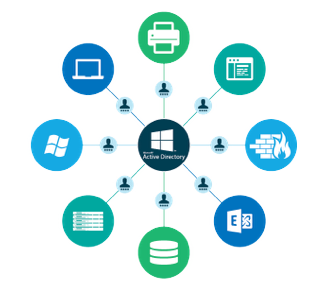 In essence, they enable IT admins to manage a fleet of Windows systems with one central management platform. AD GPOs are certainly a powerful tool. However, they are not without limitations. One major limitation is that GPOs can only be applied to Windows systems. That means IT admins will have to divert significant time and resources to manually configure the same system policies on Mac and Linux systems. Another huge limitation is that Active Directory is a legacy identity management platform designed for on-prem IT networks. IT organizations must be willing and able to invest significant capital and resources to implement and maintain a complicated on-prem infrastructure. All the while knowing that Active Directory can only solve part of the overall management puzzle in modern organizations. Of course, IT admins are aware that third party add-on solutions are available that can extend AD identities to non-Windows resources. Some of them can even provide GPO-like capabilities for Mac and Linux systems. The issue with this approach is that multiple add-ons are required to support the huge variety of IT resources that cannot be managed directly with AD. While this approach can be effective, it adds a lot of complexity and management overhead to an antiquated solution fraught with limitations. Ideally, IT organizations would be able to manage a heterogeneous fleet of systems with GPO-like capabilities. They would also be able to apply GPOs to systems without the headache of implementing and maintaining an on-prem authentication solution. The good news is that a next generation cloud identity management platform has emerged that can provide a Mac group policy equivalent. This hosted identity provider has the power to provide GPO-like capabilities to manage disparate systems as well as a comprehensive array of management capabilities for virtually any IT resource. It’s called JumpCloud Directory-as-a-Service. JumpCloud Directory-as-a-Service is a next generation cloud identity management platform that was built to manage modern IT networks. System management is a core functionality of the hosted identity provider, which can provide GPO-like capabilities for cross platform system environments (e.g., Windows, Mac, Linux). These capabilities are referred to as Policies in JumpCloud. JumpCloud Policies enable IT admins to configure system policies like screen lock timeout and disable USB ports. It is also possible to create custom commands and scripts to accomplish just about any system task not covered by JumpCloud’s library of templates. In short, JumpCloud Policies provide cross-platform system management capabilities that are in essence equivalent to Active Directory GPOs without the challenges or limitations inherent to the on-prem legacy identity provider. 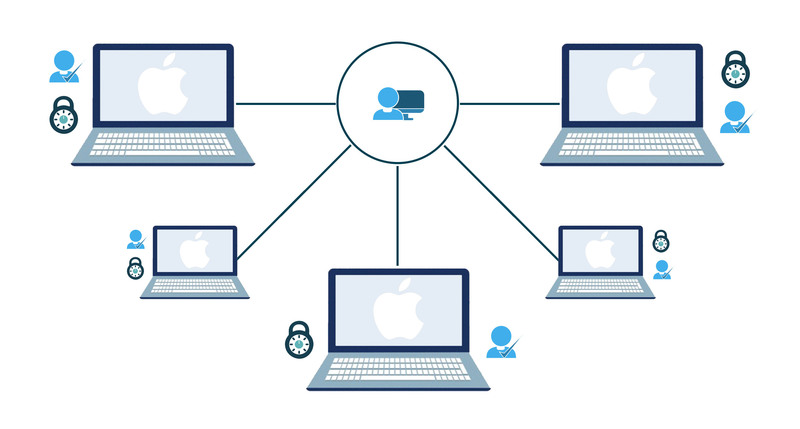 As if a Mac group policy equivalent wasn’t enough, JumpCloud Directory-as-a-Service can also provide a comprehensive array of management capabilities for virtually any IT resource regardless of platform, provider, protocol, or location. JumpCloud admins can also manage user authentication to Samba file servers, applications (whether on-prem or in the cloud), productivity platforms (G Suite, Office 365), cloud infrastructure (AWS, GCP), and even networks via RADIUS. JumpCloud Directory-as-a-Service is a cloud identity management platform that can provide a Mac group policy equivalent. In doing so, IT admins gain the ability to manage a cross platform fleet of systems with GPO-like capabilities. All without the headache or cost of implementing and maintaining an on-prem authentication solution like Active Directory. Contact the JumpCloud team for more information, or sign up for a Directory-as-a-Service account to see first hand how a Mac group policy equivalent can benefit your organization. Your first ten users are free forever to help you explore the full functionality of the JumpCloud Directory-as-a-Service platform at no cost. We don’t even require a credit card to sign up!